The AEG12II-NT's slender, single-cutaway body delivers powerful and balanced acoustic sound, unplugged or through an amp or PA system. 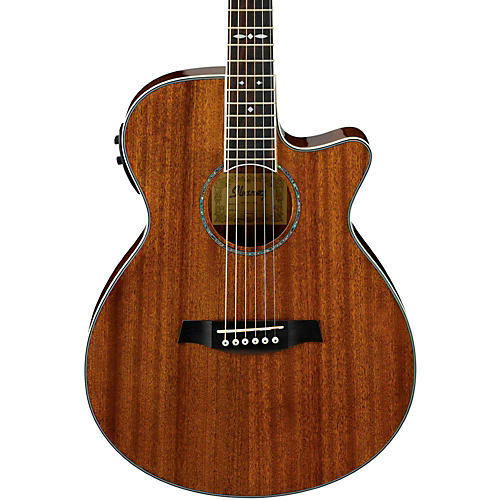 This guitar combines easy playability, a classic natural finish and an all-mahogany body to create a quality, workhorse acoustic guitar that will rise to any occasion. High-quality Fishman Sonicore pickups and Ibanez preamps with onboard tuners provide the sparkling tones that will sound great in any venue. Other appointments include a special fretboard inlay, chrome die-cast tuners, and Ibanez Advantage Bridge pins.